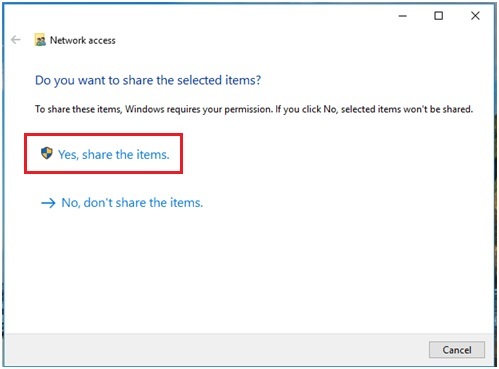 Windows 10 file sharing over network is pretty easy for you to quickly share the folder or file for access from other computers on home or wireless network. 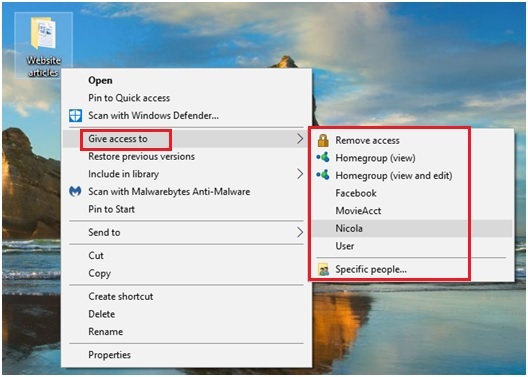 This will be really helpful since you no longer able to share folder or file via HomeGroup anymore on Windows 10 (Version 1803) installed computer. 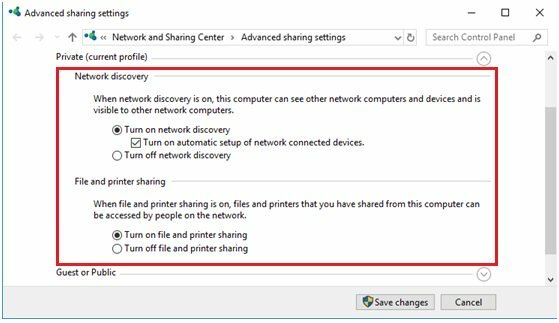 Before we proceed with the folder or file sharing, go ahead to enable network discovery and also turn on file and printer sharing for your connected network profile in Network and Sharing Center, so that the sharing will work properly later. 1) Right click the folder you would like to share and move to Give access to to select the user you would like to share with quickly (I shared with user Nicola here). Note: Although you can still see the Homegroup (view) and Homegroup (view and edit) here but they are not applicable anymore if you have installed Windows 10 (version 1803). Note: We will talk about that Specific people... option slight later in this article. 2) Go ahead to select Yes, share the items. to complete sharing. Please note this will only enable Read Only sharing. 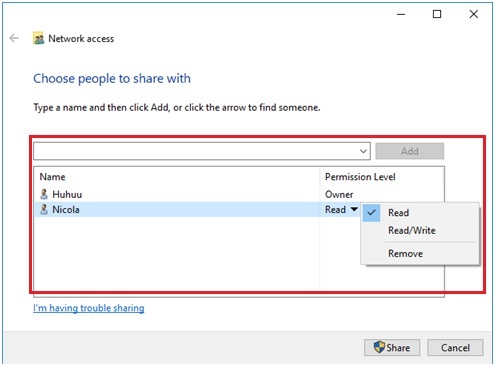 Note: If you want to grant other people Read Write access to the shared folder, you should select the specific people... option earlier and the following window will appear for you to perform folder sharing with specific people. 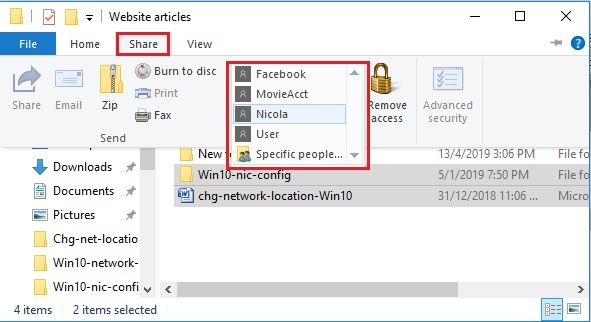 1) Select the folder or file that you would like to share in File Explorer, click on Share tab and proceed to select the user for sharing (I shared with user Nicola here). 2) Go ahead to select Yes, share the items. to complete sharing. Please note this will only enable Read Only sharing. Select Specific people... option for granting Read Write access to shared users as mentioned earlier. 1) On the other computer, open up the File Explorer and type in the target computer address in this format \\Target-computer-IP-address-or-hostname\SharedFolderName in order to access shared folder or file on target computer. As an example, I typed \\192.168.1.110 in File Explorer and hit Enter button. 2) Type in the user ID and password to authenticate before granting the access. 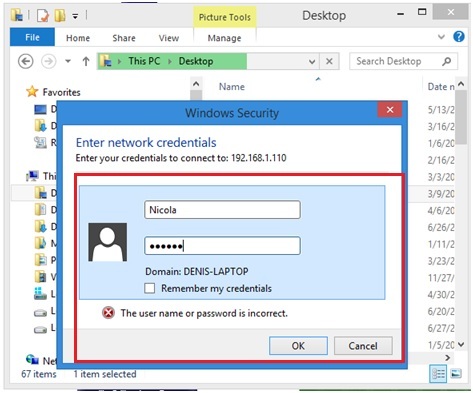 I typed in user Nicola and password as shown below. 3) You will be able to access the shared folder or file after successful authentication. Return to top of "Windows 10 File Sharing over Network"! !